Everyone knows Clinton Sparks as the hardest working DJ and producer in the business. Last year he became the first DJ to have a weekly live radio show on three different stations in three different states. In addition, his mixtapes are some of the best the game has to offer, as everyone has gotten familiar with Clinton Sparks the past couple of years. However, few really know the story behind Clinton's success and the struggles he went through. MVRemix wanted to give you the inside scoop on why Clinton Sparks is such a workaholic, and the obstacles he had to overcome to get to the position he is in today. If you have always wondered why Clinton works as hard as he does, then this interview is for you. .
MVRemix: On the intro for Maybe You Been Brainwashed, you paint a picture of your struggles coming up. So let's just talk about that for a minute. Clinton: Yo, can I just tell you something before you start? You are the first person that asked me a question like that, and that's so great. Because I'm wondering if people actually listen to the CD, or know what I'm about? People don't ask me any questions about me; they just ask me the basics - "Who is on the album, what are you working on, who did you liking word with, blah, blah, blah". And it's so beautiful that you asked me a question about my intro. MVRemix: Thank you man, I appreciate that. I feel that a lot of times that is lacking in interviews, so I always try and get to know where the artist has been before moving onto the "typical questions". So let me ask you, have you always dreamt about doing music for a living? Clinton: Yeah, as far back as I can remember. When I was 10 years old, I would be in my room trying to remix songs. I used to try to remix everything from Prince to Twisted Sister. And my mom had this little stereo, which I was able to make cut by holding in the phono and then pressing auxiliary. And that would take the place of the cross fader, whenever I would press auxiliary, you would be able to hear the record. That's how I taught myself how to DJ. I used to also have a duel cassette desk, and I used to do stupid things like, "Let's gooo craaaazzy". And I would rewind that, then pause it, rewind it, pause it - until I got the timing perfect. So that�s how I was able to perfect my timing when I was like 11 years old. That was the beginnings of me trying to become a DJ/producer. MVRemix: When did you know that Hip Hop was something you professionally wanted to do with your life? Clinton Sparks: Obviously, when you are doing something like this, it's technically a hobby and you always dream of it being something you do for a living. But what made me really have to do it for real was; I used to work for UPS in the mid '90's. I worked there for four years part time, then I become a full time employee, which meant I was driving the trucks and doing a full delivery route. Then 28 days after I became full time I was carrying an 85-pound package up the stairs, and the stairs collapsed! So I injured my spine and I had to have spinal surgery. My whole life, all I did was hard labor. Whether I was a stockman at Mattress Discount, or working at UPS or a moving company, no matter what it was, I always did hard labor. I just love working; I always looked at it like - the harder I worked, the more I was doing. I'm just weird like that. But once I had my spinal surgery, I knew I had to take this Hip Hop thing seriously. That was all I had left to do, because I didn't go to college, I have no degree in anything, and now I can't use my body for hard labor. So that was the transition, from doing Hip Hop on the weekends and at night time, to me really having to do it full time and make it my profession. MVRemix: You said you enjoy hard work, but what would you attribute that to? Is that something you got from your parents? Clinton Sparks: Nah, I think I attribute it to being dead broke, living with roaches, having no money, and my dad leaving - things like that. Ever since I was young, I was preparing myself for the future. Without even having a family, I was preparing myself so that my kids will never have to go through what I went through. Because I literally lived in my truck, in the dead cold winter, for a couple of months. There were times when it was so cold out, that I thought I wouldn't wake up the next day. It was that cold that I thought I would freeze to death over night. So I never want my son to have to go through that. And that is the reason why I think I'm such a maniac in regards to working. Because everybody says it to me, they don't understand how I work so much, and why I do all the things I do. Because I won't say no to any job. Anything that comes my way, I'll do it, even if my plate is full. Its because I'm always nervous about tomorrow, and I'm nervous about a year from now. Its almost like I live in the future instead of the present. Which can be a bad thing sometimes, but it also can secure my future and make sure my family is good. MVRemix: Did people really doubt you and your career goals? Clinton Sparks: Yeah, of course. Everybody deals with hate and doubt when they have a dream and a goal they are trying to accomplish, so its nothing new. But people would hate on me because I was white, which was an issue. Then when I tried to leave Boston and branch out, the fact that I was white and I was from Boston were two issues that really hurt. Because for some reason, Boston had a black cloud over it. And people really don't know who you are until they take the time to get to know you. 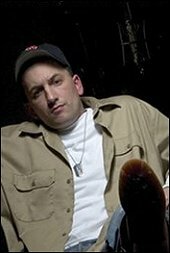 So when you look at this white dude that comes from Boston, and he is trying to get in the Hip Hop game, everybody was like, "Oh, what does he know about Hip Hop? He probably has money, and comes from a good home". And I'm not mad at that, but that�s the facts of life, and I had to work through it. And I'm never one to brag about what I went through. I'm definitely not proud of it, and the things I had to do when I was younger to get money. But yeah, I had to deal with a lot of doubt and hate. Now things are all good, and people have gotten familiar. MVRemix: Take us through the process of how you got your foot in the Hip Hop industry's door? Clinton: I used to produce beats in my bedroom and take popular acappella's and put them over my beats. I used to do it for fun; because that was the way I practiced. But eventually one of the big radio DJ's at the station heard my stuff and was like, "This is incredible, I want to play this on my show". So he started to play it, and that was my first taste of getting my stuff played on the radio. Then he would tell other people in the industry that there is this guy Clinton Sparks and he has some hot beats. But people were like, "Whatever", because they didn't want to hear about some guy who made beats, they just wanted their record to be played. So every time I got shot down, or I saw how they were looking right through me when I was talking to them, I would sit down and ask myself, "What do I have to do to make these people really pay attention to me?" That is when I came to the conclusion that I had to become one of the most powerful DJ's in radio. (Laughter) So my next quest was to get on the radio, and that's how it all started. MVRemix: Then after that you got into the mixtape game? Clinton Sparks: Nah, actually, I was doing mixtapes before radio. All of the remixes I was doing I was putting on mixtapes. Because one of the things I'm known for with my mixtapes is I produce most of the tracks on there. I just don't get exclusives and throw them on a CD, I produce half of the mixtape and make original tracks. And I have been doing that since '97, it wasn't like I started making regular ones and then got into that. And at that time, I was just selling a couple hundred in Boston, because I was still really young. I didn't know about the big business of it, or how to branch out. But eventually, I wanted to take it to the next level, because that was when my stuff was on the radio and I was starting to make a name for myself. So I pressed up twenty five hundred CD's one time, and I literally went to the post office for the whole day and shipped out packages to every store across the country. I gave everyone twenty CD's for free, and this was back in '98, when the market wasn't oversaturated like it is now. So when people got a CD back then, they would actually listen to it. And when I shipped the CD's I put in a letter stating what I did, and how to contact me if you liked what you heard. That's basically how it started to jump off. And I knew once people heard my stuff they would like it. The object was just to get people to hear me. Because it was like drugs, and once people heard it, I knew they would be calling me for the next one. "Everybody deals with hate and doubt when they have a dream and a goal they are trying to accomplish, so its nothing new. But people would hate on me because I was white, which was an issue."